»Digital measurement ensures the perfect fit of the compression clothing. BodyLux® is a full-body 3D shape measuring system which provides a complete 360° scan and calculates all measurements of the lower part of the body. The implemented measurement methodology combines DLP® Technology of Texas Instruments - the micromirror projection with phase-coded photogrammetry, enabling outstanding accuracy, speed and reliability of the system. 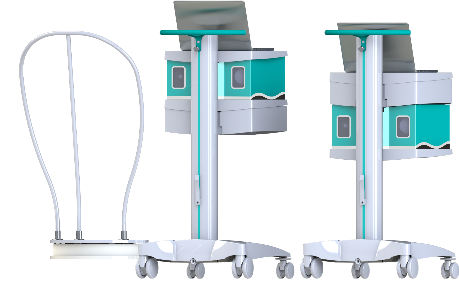 The system consists of two parts: the cart within the integrated sensor unit and the turntable with handhold, which enables safe ascending and descending. The measurement requires no special clothing and the data acquisition is in no way physically exhausting due to the short measurement time. After completing the 360​​° scan, the ViALUX software generates the 3D model, which serves as starting point for the automatic measurement. In addition, the data for further supply measures can be exported as an STL-model. All body measurements are automatically calculated by the software in accordance with RAL-GZ 387/1 or manufacturer specifications. The BodyLux® is used in the field of compression clothing. For a perfect fit and the resulting optimal effect, an accurate measurement is decisively. This is guaranteed by the mobile 3D body scanner BodyLux®. Contactless and fast, all dimensions of the lower body are determined within 50 seconds. All required circumference and length dimensions are calculated automatically from the measured data and the order is generated. Users of the device solution benefit from the free choice of compression stocking manufacturers as well as the ability to compare customer measurement data, which were determined at different times. There is an extent and volume comparison. Also the digital model can be used for further aid supply. The BodyLux® system and the BodyLux® software are developed and produced according to the regulations of EN 13485 for medical devices. 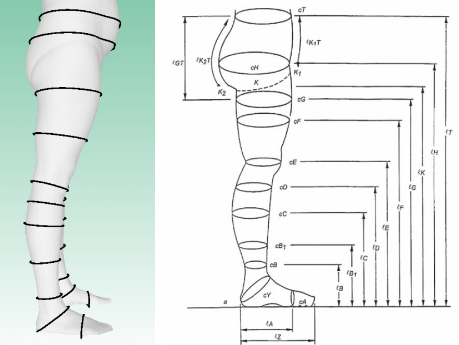 BodyLux® classic: The customer's measurement is carried out for the area of the lower body - from the toe to the waist. 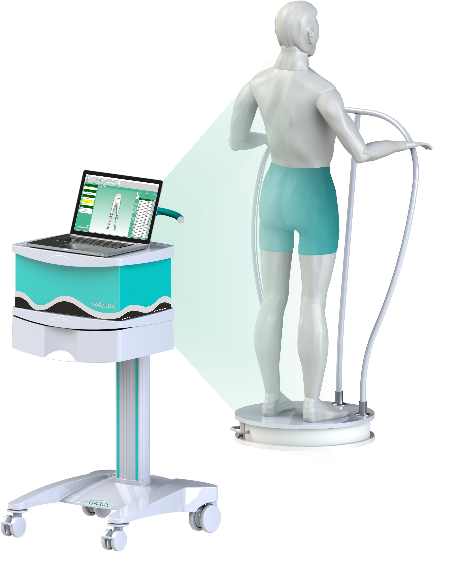 BodyLux® plus: The higher arrangement of the scan unit at the cart allows the measurement of the lower body plus torso. The necessary body dimensions for compression clothing are measured optically and are calculated according to RAL-GZ 387/1. Basis for calculating the body dimensions is the digital 3D model of the customer. The operator has access to the interactive 3D model of his customer and can move the measuring rings to consider anatomical features. All measurements are archived in the customer database. They can be called up at any time and can be saved local by backup. BodyLux® is not bound to a compression stocking producer. Currently, products from eight different producers, including specific order forms, are supported. For the lymphological care, the gained skin size can be used for cost estimates. Measuring and customer data are automatically entered into the forms. These forms can be edited in BodyLux® Software and are available as pdf files for transfer into the industry software (i.e. opta data, TopM, acriba, mmOrthosoft®). BodyLux® Software also supports automatic processing of measuring data - SaniVision and the online stores of Juzo and medi, for example, make use of this feature. To determine standard sizes the BodyLux® software compares the calculated body dimensions to the manufacturer specific size table. Color-coded boxes help quickly to select the appropriate compression product. The expert staff decides which product is handed over to the customer. 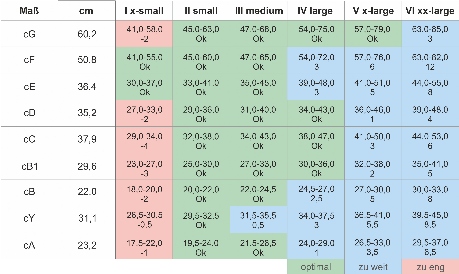 Customers measurement data which were determined on different times can be compared. 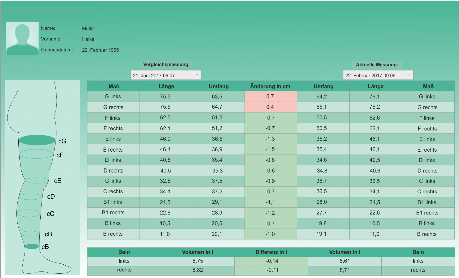 There is an extent and volume comparison and changes are automatically calculated and displayed. This function is available for all product areas.